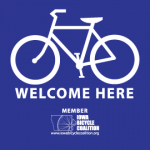 The mission of the Iowa Bicycle Coalition is promote bicycling as safe and enjoyable transportation and recreation. The work we are able to achieve is due to our members! Our membership network is our voice and the bigger the network is, the louder our voice will be. Businesses play a vital role in creating a bike friendly state. When businesses offer incentives for bicycling and make it easier for their employees to commute by bike, it encourages employees to try it. The more an employee bikes to work, on average, the healthier, happier, and more productive the employee becomes. This leads to a greater economic advantage for your business, in addition to the environmental benefits due to fewer cars on the road. By joining the Iowa Bicycle Coalition, you support the programs and efforts we do to facilitate healthier and more active lifestyles. It benefits both employers and employees to promote healthy living. People who are encouraged to bike to and from work, to run errands by bike, and/or to bike in their leisure time perform better at their jobs because they are more energized and alert. A positive environment is easily created with a healthier and more productive workforce, thus creating higher retention of quality employees.